Is the Sauna Useful? If so, When and For How Long Should You Sit? When asked about the advantages of sauna use at the gym, most people reply with something about detoxing and sweating out the bad stuff. While there is truth to this, I used to joke about the sauna being part of the “executive workout package” and would rarely incorporate it into my week unless I was post-holiday, birthday, or vacation and in need of some detox. 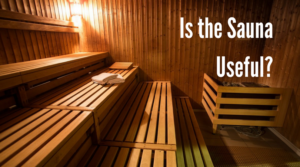 Until a few years ago that is when I was lucky enough to come across a study showing a benefit to strength gains through sauna use after an intense strength session. (I couldn’t find the link to this study, but it showed sauna use post workout reducing fiber damage allowing strength gains to be maximized and recovery time minimized.) This aligned with my goals so I started to incorporate sauna post workout, especially after a more intense session. A few months later I had my genetic testing done and started learning about how to maximize beneficial gene expression through nutrition, lifestyle, and supplementation. (I highly recommend getting your genetic testing done as it dramatically reduces the guess work in nutrition and workout programming.) Through these readings I saw many studies finding significant long and short term health marker increases from sauna use beyond what I thought possible. First, for anyone dealing with one or more risks of cardiovascular disease, a recent study showed dramatic improvements in many important biomarkers indicating reduced risk after just one 30 minute session. (Please don’t be ‘that guy/girl’ and hit the sauna once thinking you’re all fixed… just in case you are I’ll list some upsides to continued use.) If hypertension is a concern for you, then consistent use should be important. A study from The American Journal of Hypertension showed sauna use of 2-3 times/week cutting risk by a quarter and 4-7 time nearly halving it. The point here: on top of eating well and working on your conditioning, spend some time in a hot box. There have also been findings published that show sauna use maintaining muscle mass and strength during immobilization or injury. This is obviously useful for me right now (those that don’t know, I had my leg pinned between 2 vehicles by an intoxicated driver on 11/20/17), but I had used this strategy during de-load phases as well. So, what do you do with all this info? First, it’s always a good idea to talk to your doctor about something like this. (If they ask why you’re interested, feel free to send them all the links provided in this article.) Even once you’re cleared to “go hot”, I would advise using the buddy system, and especially the first time you enter a sauna. The common times I see referenced in research results are 15-20 minutes. I’ve been sitting for 20 minutes, 2-5 times a week (on the higher end now, given my situation.) The temperatures used tend to be around 160-170 degrees Fahrenheit and I’ve seen anecdotal reasoning for toweling off every 7-10 minutes so as to not reabsorb the toxins you’ve released back into your pores (makes sense.) If you’re strength training… *ahem* which you should be… *ahem* plan sauna time after your strength sessions to decrease soreness, speed recovery, as well as all the additional upsides coming with it. Thanks for reading! Please share this info to help make a healthier world.